In this new video, we're going to take a look at ionization energy. We're going to say that metals, we've talked about this before, metals tend to lose electrons. If you're losing negatively charged electrons, then you become a positive ion called a cation. Ionization energy is just the energy it takes to remove an electron. If you lose electrons very easily, you're not going to need a lot of energy to remove them because metals are just giving them away for free. We're going to say, therefore, metals have low ionization energies. Nonmetals, on the other hand, they love to gain electrons, to become negative ions called anions. Ionization is the energy it takes to remove an electron, but if I love to gain electrons, you're going to have to fight very hard with me to take the electrons away from me. As a result, we're going to say that nonmetals have high ionization energies. Like we said, ionization energy is the energy in kilojoules or joules required remove an electron from a gaseous atom or ion. We're going to say generally speaking, ionization energy is going to increase going from left to right of a period. It's going to decrease going down a group. It decreases going down a group because as you go down any group, you become more like a metal. Metals like to lose electrons very easily. Therefore, there's not much energy required to remove them. If we see this little box here, we'll just say it increases going this way and it decreases going this way. Just remember that trend. A good example here, we just say an atom in its gaseous phase, if you remove an electron, it becomes more positive, so it becomes a positive ion. Good example, you could have sodium gas, you remove an electron, so it becomes Na+ gas plus the electron we removed. Now, remember, what are you doing? You're technically breaking a bond. You're removing an electron, so you're breaking a bond. We're going to say breaking bonds is basically an endothermic reaction. Endothermic or endergonic since we're dealing with energy. In either case, whether you describe it as endothermic or endergonic, both are saying the same thing. We're breaking bonds. When we're breaking bonds, the energy is going to be above zero. Just remember, breaking bonds means it's an endothermic or endergonic reaction. That means that our change in energy will be above zero. When we form bonds, the change in energy will be less than zero. That would be an exothermic or an exergonic reaction. Ionization energy is the energy required to remove an electron from a gaseous element. We're going to say, generally speaking, ionization energy increases going from left to right and decreases going down a group. But there are exceptions to this. There's two major exceptions you need to remember. We're going to say when in the same period, group 6A elements, even though they're more to the right, actually have a lower first ionization energy than groups in 5A. Group 6A elements, when they're in the same period, actually have lower ionization energy than group 5A in the same period. Let's take an example here. Here we have oxygen and nitrogen. Oxygen is in group 6A. Nitrogen is in group 5A. They're both in period 2, so they're both in the same period, so this rule applies to them. Now, oxygen, it's electron configuration would be 1s2, 2s2, 2p4, and nitrogen would be 1s2, 2s2, 2p3. It would be up, down, up, down, up, up, up, down, up, down, up, down, up, up, up. Remember, this is the way we would fill it in following Aufbau principle where we go from 1s to 2s to 2p. Then when we get to 2p, those electrons are degenerate again. They have the same energy, so we half fill them first using Hund's rule. Now, think about it like this, ionization energy is the energy it takes to remove an electron. I'm going to remove the last electron that I added when I created this electron configuration. The last electron I added was this one that's pointing down. When I remove it, my electron configuration then becomes 1s2, 2s2, 2sp3. It's best if p just like d is totally half-filled or totally filled in. By removing that electron from oxygen, oxygen becomes half-filled. That's more favorable here than having two half-filled ones. It's more favorable to have our p or our d totally half-filled, like we do here, or to have them totally filled in. Now if we remove the last electron we added for nitrogen, we remove this one, it becomes this. This is less favorable because we just said, p, just like d, prefers to be half-filled or totally filled in. Nitrogen started off as half-filled, so it's very unlikely and not really favored if we try to come in and take off that electron because then it stops being half-filled. That's why oxygen actually has a lower first ionization energy than nitrogen. Now, we're going to say there's another exception. We're going to say when in the same period, group 3A elements have a lower ionization energy than group 2A. Here we have boron. Boron's electron configuration would be 1s2, 2s2, 2p1. Beryllium would be 1s2, 2s2. They're both in the same period, so this rule applies to them. This would be up, down, up, down, up. This would be up, down, up, down. Now, we want to take off an electron using ionization energy, so we take off the electron that was added last, so we would be removing this electron from boron leaving us with one up, one down, one up, one down. This is highly favored because everyone is paired up. Remember, you want to either be half-filled if you're in p or d or totally filled if you're in p and d. If you're s, you want to be totally filled in. S is most favorable when both electrons in that orbital are paired up to each other. They're completely filled in. So this is great. Beryllium, we'd be removing this electron here. We'd be left with that. We'd be left with a half filled s orbital. Highly unfavored. You want the s orbital to be totally filled in. So by removing an electron, boron actually becomes more favorable, so that's why it's better that it has a lower ionization energy than beryllium. Just remember the common trend of ionization energy is this, but then remember the two exceptions. Group 6A has lower first ionization energy than group 5A if they're in the same period. If they're in different periods, then we go back to the default trend we talked about when we looked at the chart. We're going to say group 3A has a lower first ionization energy than group 2A when they're in the same period. If they're not in the same period then we go back to the default rule, which would be this rule. That exception only works if the elements we're talking about are in the same period with each other. Example #1: Of the following atoms, which has the smallest second ionization energy? Practice: Of the following atoms, which has the smallest third ionization energy? Practice: Which of the following statements is/are true? Practice: Shown below are the numerical values for ionization energies (IE's). Match the numerical values with each of the following elements provided in the boxes. The first three ionization energies for Ba is given in the graph below. Explain this trend in terms of the electronic configuration; in particular, discuss why the third ionization energy is almost 4 times higher than the second. Which do you expect to require more energy: removing the electron from a H atom, or removing the electron from a He+ ion? Explain your reasoning using number or words. Helium has two electrons in the 1s orbital. When it becomes singly ionized, forming He+, (A) its spectrum resembles that of the hydrogen spectrum. (B) the remaining electron is easier to remove. (C) the nuclear charge has decreased by one. (D) it has lost one atomic mass unit. The process of removing an electron from a neutral element in the gas phase… a. requires energy for all elements, because the initial state is less stable than the final state. b. requires energy for all elements, because the initial state is more stable than the final state. c. does not require energy for any element, because the initial state is the same energy as the final state. d. requires energy for some elements, because sometimes the initial state is more stable than the final state. Elements in group 7A in the periodic table are the halogens; elements in group 6A are called the chalcogens.For each of the following periodic properties, state whether the halogens or the chalcogens have larger values: atomic radii, ionic radii of the most common oxidation state, first ionization energy, second ionization energy. Based on what you just learned about ionization energies, explain why valence electrons are more important than core electrons in determining the reactivity and bonding in atoms. In April 2010, a research team reported that it had made Element 117. This discovery was confirmed in 2012 by additional experiments.Estimate a value for its first ionization energy based on its position in the periodic table. Which element in the periodic table has the largest ionization energy? Which element in the periodic table has the smallest ionization energy? Figure Trends in first ionization energies of the elements.The value for astatine, At, is missing in this figure. To the nearest 100 kJ/mol,what estimate would you make for the first ionization energy of At? What is the difference between first ionization energy and second ionization energy? Examination of the first few successive ionization energies for a given element usually reveals a large jump between two ionization energies. For example, the successive ionization energies of magnesium show a large jump between IE2 and IE3. The successive ionization energies of aluminum show a large jump between IE3 and IE4.Explain why these jumps occur and how you might predict them. Explain the variation in ionization energies of carbon, as displayed in the graph. What value of the effective nuclear charge gives the proper value for the ionization energy? One way to measure ionization energies is photoelectron spectroscopy (PES), a technique based on the photoelectric effect. In PES, monochromatic light is directed onto a sample, causing electrons to be emitted. The kinetic energy of the emitted electrons is measured. The difference between the energy of the photons and the kinetic energy of the electrons corresponds to the energy needed to remove the electrons (that is, the ionization energy). Suppose that a PES experiment is performed in which mercury vapor is irradiated with ultraviolet light of wavelength 58.4 nm. Write an equation that shows the process corresponding to the first ionization energy of Hg. One way to measure ionization energies is photoelectron spectroscopy (PES), a technique based on the photoelectric effect. In PES, monochromatic light is directed onto a sample, causing electrons to be emitted. The kinetic energy of the emitted electrons is measured. The difference between the energy of the photons and the kinetic energy of the electrons corresponds to the energy needed to remove the electrons (that is, the ionization energy). Suppose that a PES experiment is performed in which mercury vapor is irradiated with ultraviolet light of wavelength 58.4 nm. The kinetic energy of the emitted electrons is measured to be 10.75 eV. What is the first ionization energy of Hg, in kJ/mol? Arrange the following elements in order of decreasing first ionization energy: Si, F, In, N.
Consider the following elements: N, Mg, O, F, Al.Arrange the elements in order of decreasing ionization energy. Consider the elements: B, C, N, O, F.Which element has the highest first ionization energy? Hydrogen is an unusual element because it behaves in some ways like the alkali metal elements and in other ways like nonmetals. Its properties can be explained in part by its electron configuration and by the values for its ionization energy and electron affinity.Explain why the ionization energy of hydrogen is closer to the values for the halogens than for the alkali metals. Consider the elements: Na, Mg, Al, Si, P.Which element has the highest second ionization energy? Write equations that show the processes that describe the first, second, and third ionization energies for a gaseous aluminum atom. What is the general trend in first ionization energy as you move down a column in the periodic table? Which element has the highest second ionization energy? What is the general trend in first ionization energy as you move across a row in the periodic table? What are the exceptions to the periodic trends in ionization energy? Which is more reluctant to give up an electron, lithium or oxygen? Which is more willing to give up an electron, lithium or oxygen? The trend in second ionization energy for the elements from lithium to fluorine is not a smooth one. Predict which of these elements has the highest second ionization energy and which has the lowest and explain. Of the elements N, O, and F, O has the highest and N the lowest second ionization energy. Explain. The outermost valence electron in atom A experiences an effective nuclear charge of 2+ and is on average 225 pm from the nucleus. The outermost valence electron in atom B experiences an effective nuclear charge of 1+ and is on average 175 pm from the nucleus.Which atom (A or B) has the highest first ionization energy? Table: Some Properties of the Halogens Element Electron Configuration Melting Point (oC) Density Atomic Radius (Å) I1 (kJ/mol) Fluorine [He]2s22p5 -220 1.69 g/L 0.57 1681 Chlorine [Ne]3s23p5 -102 3.12 g/L 1.02 1251 Bromine [Ar]4s23d104p5 -7.3 3.12 g/cm3 1.20 1140 Iodine [Kr]5s24d105p5 114 4.94 g/cm3 1.39 1008 Use the data from the table above to provide estimates for the first ionization energy of an astatine atom? Would you expect it to require more or less energy to remove a 3s electron from the chlorine atom, as compared with a 2p electron? Unlike the elements in groups 1A and 2A, those in group 3A do not show a smooth decrease in first ionization energy in going down the column. Explain the irregularities. Consider the first ionization energy of neon and the electron affinity of fluorine.Write equation for the first ionization energy of neon. Until the early 1960s the group 8A elements were called the inert gases.What name is applied to the group now? If you remove a single electron from a P atom, which orbital will it come from? Write a chemical equation representing the second ionization energy for lithium. Identify the element of Period 2 which has the following successive ionization energies, in kJ/mol. Write a chemical equation representing the second ionization energy for lithium. Use e- as the symbol for an electron. Comparing the ionization energies of chlorine, selenium and sulfur. a. S &gt; Se and S = Cl. b. S &gt; Se and S &gt; Cl. c. S &lt; Se and S &lt; Cl. d. S &gt; Se and S &lt; Cl. e. S &lt; Se and S = Cl. The first ionization potential of the elements B, C, and N (atomic numbers 5, 6, and 7) steadily increases, but that of O is less than that of N. The best interpretation of the lower value for O is that A. there is more shielding of the nuclear charge in O than in B, C, or N. B. the ionization potential of N is a maximum and the values decrease steadily for the elements O, F, and Ne. C. the half-filled set of p orbitals in N makes it more difficult to remove an electron from N than from O. D. the electron removed from O is farther from the nucleus and therefore less tightly bound than that in N. E. the electron removed from O corresponds to a different value of the quantum number ℓ than that of the electron removed from B, C, or N.
Which graph shows the correct trend for ionization energies, IE, of aluminum, Al? Rank these elements according to first ionization energy. Write chemical equations for first ionization step of carbonic acid Write chemical equations for second ionization step of carbonic acid. Consider the following set of successive ionization energies: IE1 = 1012kJ/mol IE2 = 1,920kJ/mol IE3 = 2,910kJ/mol IE4 = 5,000kJ/mol IE5 = 6,300kJ/mol IE6 = 21,220kJ/mol IE7 = 29,780kJ/mol To which third period element (enter the symbol or name) do these ionization values belong? You may want to reference (Pages 268 - 272) Section 7.4 while completing this problem.Identify which of the following statements are true. (a) Ionization energies are always negative quantities. (b) Oxygen has a larger first ionization energy than fluorine. (c) The second ionization energy of an atom is always greater than its first ionization energy. (d) The third ionization energy is the energy needed to ionize three electrons from a neutral atom. Consider the following set of successive ionization energies:IE1 = 578/molIE2 = 1,820/molIE3 = 2,750/molIE4 = 11,600/molTo which third-period element do these ionization values belong? For each of the following pairs of elements:(Mg and K) (F and Cl)pick the atom with the higher ionization energy. Mercury in the environment can exist in oxidation states 0, +1, and +2. One major question in environmental chemistry research is how to best measure the oxidation state of mercury in natural systems; this is made more complicated by the fact that mercury can be reduced or oxidized on surfaces differently than it would be if it were free in solution. XPS, X-ray photoelectron spectroscopy, is a technique related to PES, but instead of using ultraviolet light to eject valence electrons, X-rays are used to eject core electrons. The energies of the core electrons are different for different oxidation states of the element. In one set of experiments, researchers examined mercury contamination of minerals in water. They measured the XPS signals that corresponded to electrons ejected from mercurys 4f orbitals at 105 eV, from an X-ray source that provided 1253.6 eV of energy. The oxygen on the mineral surface gave emitted electron energies at 531 eV, corresponding to the 1s orbital of oxygen. Overall the researchers concluded that oxidation states were +2 for Hg and –2 for O.Compare the energies of the 4f electrons in mercury and the 1s electrons in oxygen from these data to the first ionization energies of mercury and oxygen from the data in this chapter. Consider the following statements about first ionization energies:Because the effective nuclear charge for Mg is greater than that for Be, the first ionization energy of Mg is greater than that of Be.The first ionization energy of O is less than that of N because in O we must pair electrons in the 2p orbitals.The first ionization energy of Ar is less than that of Ne because a 3p electron in Ar is farther from the nucleus than a 2p electron in Ne.Which of the statements I, II, and III is or are true? Which would you expect to be greater, I1 for a boron atom or I2 for a carbon atom? The energy of an electron in a one-electron atom or ion equals(–2.18 x 10–18 J)(Z2/n2), where Z is the nuclear charge and n is the principal quantum number of the electron. Estimate the first ionization energy of Li. The energy of an electron in a one-electron atom or ion equals(–2.18 x 10–18 J)(Z2/n2), where Z is the nuclear charge and n is the principal quantum number of the electron. Estimate the first ionization energy of Li. Compare the result of your calculation with the value 520 kJ/mol, and explain the difference. Name the element described in the following: Highest IE 1 in Group 4A(14). The energy of an electron in a one-electron atom or ion equals(–2.18 x 10–18 J)(Z2/n2), where Z is the nuclear charge and n is the principal quantum number of the electron. Estimate the first ionization energy of Li. Compare the result of your calculation with the value 520 kJ/mol, and explain the difference.What value of the effective nuclear charge gives the proper value for the ionization energy? Does this agree with your explanation? Name the element described in the following: Lowest IE 1 in Period 5. Arrange the following elements in order of decreasing first ionization energy: S, Ca, F, Rb, and Si. One way to measure ionization energies is photoelectron spectroscopy (PES), a technique based on the photoelectric effect. In PES, monochromatic light is directed onto a sample, causing electrons to be emitted. The kinetic energy of the emitted electrons is measured. The difference between the energy of the photons and the kinetic energy of the electrons corresponds to the energy needed to remove the electrons (that is, the ionization energy). Suppose that a PES experiment is performed in which mercury vapor is irradiated with ultraviolet light of wavelength 58.4 nm.With reference to the figure, determine which of the halogen elements has a first ionization energy closest to that of mercury. Write an equation corresponding to the fourth ionization energy of Se. Write an equation corresponding to the ionization energy of Mg. Using data from the text, determine the ionization energy of Cl -. Justify your answer. Ground-state ionization energies of some one-electron species are:H = 1.31 x 10 3 kJ/mol He + = 5.24 x 10 3 kJ/mol Li 2+ = 1.18 x 10 4 kJ/molWrite a general expression for the ionization energy of any one-electron species. Arrange the following elements in order of decreasing first ionization energy: Po, Cl, Te, and S.
Ground-state ionization energies of some one-electron species are:H = 1.31 x 10 3 kJ/mol He + = 5.24 x 10 3 kJ/mol Li 2+ = 1.18 x 10 4 kJ/molUse your expression to calculate the ionization energy of B 4+. Ground-state ionization energies of some one-electron species are:H = 1.31 x 10 3 kJ/mol He + = 5.24 x 10 3 kJ/mol Li 2+ = 1.18 x 10 4 kJ/molWhat is the minimum wavelength required to remove the electron from the n = 3 level of He +? A fundamental relationship of electrostatics states that the energy required to separate opposite charges of magnitudes Q1 and Q2 that are a distance d apart is proportional to (Q 1 x Q 2)/d . Use this relationship and any other relevant factors to explain the following: The IE 2 of He (Z = 2) is more than twice the IE1 of H (Z = 1). Ground-state ionization energies of some one-electron species are:H = 1.31 x 10 3 kJ/mol He + = 5.24 x 10 3 kJ/mol Li 2+ = 1.18 x 10 4 kJ/molWhat is the minimum wavelength required to remove the electron from the n = 2 level of Be 3+? A fundamental relationship of electrostatics states that the energy required to separate opposite charges of magnitudes Q1 and Q2 that are a distance d apart is proportional to (Q 1 x Q 2)/d . Use this relationship and any other relevant factors to explain the following: The IE 1 of He is less than twice the IE1 of H.
Consider the following elements: P, Ca, Si, S, Ga.Arrange the elements in order of decreasing ionization energy. Write equations that show the processes that describe the first, second, and third ionization energies of an aluminum atom. Which process would require the least amount of energy? Enter equations that show the following processes.The first two ionization energies of lead. Write the formula and name of the compound formed from the following ionic interaction: The ions form from the largest and smallest ionizable atoms in Period 2. You may want to reference(Pages 272 - 273)Section 7.5 while completing this problem.For the following pair, indicate which element has the lower first ionization energy: (a) Ti, Ba; (b) Ag, Cu; (c) Ge, Cl; (d) Pb, Sb. Arrange the atoms in order of increasing first ionization energy: Te, S, Se. 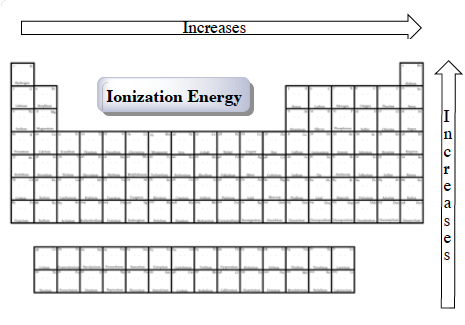 Arrange the atoms in order of increasing first ionization energy: K, Br, Ni. Arrange the atoms in order of increasing first ionization energy: Ba, Si, F.
Arrange the atoms in order of increasing first ionization energy: Rb, Na, Be. Arrange the atoms in order of increasing first ionization energy: Sr, Se, Ne. Arrange the atoms in order of increasing first ionization energy: Fe, P, O. There are some exceptions to the trends of first and successive ionization energies. For the following pair, explain which ionization energy would be higher: IE1 of Ga or IE1 of Ge. There are some exceptions to the trends of first and successive ionization energies. For the following pair, explain which ionization energy would be higher: IE2 of Ga or IE 2 of Ge. There are some exceptions to the trends of first and successive ionization energies. For the following pair, explain which ionization energy would be higher: IE3 of Ga or IE 3 of Ge. There are some exceptions to the trends of first and successive ionization energies. For the following pair, explain which ionization energy would be higher: IE4 of Ga or IE 4 of Ge. Arrange these elements in order of decreasing first ionization energy: Cl, Sn, Si. (a) Use the figure below to find the longest wavelength of electromagnetic (EM) radiation that can ionize an alkali metal atom. The ionization energies of an unknown third period element are shown below:IE1 = 786 kJ/molIE2 = 1580 kJ/molIE3 = 3230 kJ/molIE4 = 4360 kJ/molIE5 = 16,100 kJ/molWrite the symbol of the element. The following values are the only energy levels of a hypothetical one-electron atom:E6 = −2 x 10−19 J E 5 = −7 x 10−19 JE4 = −11 x 10−19 J E 3 = −15 x 10−19 JE2 = −17 x 10−19 J E 1 = −20 x 10−19 JWhat is the ionization energy (in kJ/mol) of the atom in its ground state? (b) Use the figure below to find the longest wavelength of EM radiation that can ionize an alkaline earth metal atom. (b) Use the figure below to find the longest wavelength of EM radiation that can ionize an alkaline earth metal atom. (c) Use the figure below to find the elements, other than the alkali and alkaline earth metals, that could also be ionized by the radiation in part (b). Which atom has the smallest ionization energy: Ca, Sr, or Ba? Which atom has the smallest ionization energy: K, Mn, or Ga? Which atom has the smallest ionization energy: N, O, or F? Which ion has the smallest ionization energy: S2-, S, or S2+? Which atom has the smallest ionization energy: Cs, Ge, or Ar? The successive ionization energies for an unknown element are:I1 = 896 kJ/molI2 = 1752 kJ/molI3 = 14,807 kJ/molI4 = 17,948 kJ/molTo which family in the periodic table does the unknown element most likely belong? Based on their positions in the periodic table, predict which has the largest first ionization energy: Mg, Ba, B, O, Te. Based on their positions in the periodic table, predict which has the smallest first ionization energy: Li, Cs, N, F, I. The first ionization energies of As and Se are 0.947 and 0.941 MJ/mol, respectively. Rationalize these values in terms of electron configurations. Based on their positions in the periodic table, rank the following atoms in order of increasing first ionization energy: F, Li, N, Rb. Rank the elements Be, B, C, N, and O in order of increasing first ionization energy. Explain your reasoning. Based on their positions in the periodic table, rank the following atoms in order of increasing first ionization energy: Mg, O, S, Si. Consider the following ionization energies for aluminum:Al(g) → Al+(g) + e- I1 = 580 kJ/molAl+(g) → Al2+(g) + e- I2 = 1815 kJ/molAl2+(g) → Al3+(g) + e- I3 = 2740 kJ/molAl3+(g) → Al4+(g) + e- I4 = 11,600 kJ/molAccount for the trend in the values of the ionization energies. An unknown element is a nonmetal and has a valence electron configuration of ns2 np4. Would this element have a greater or smaller ionization energy than fluorine? Consider the following ionization energies for aluminum:Al(g) → Al+(g) + e- I1 = 580 kJ/molAl+(g) → Al2+(g) + e- I2 = 1815 kJ/molAl2+(g) → Al3+(g) + e- I3 = 2740 kJ/molAl3+(g) → Al4+(g) + e- I4 = 11,600 kJ/molExplain the large increase between I3 and I4. The following graph plots the first, second, and third ionization energies for Mg, Al, and Si.Without referencing the text, which plot corresponds to which element? In one of the plots, there is a huge jump in energy between I2 and I3, unlike in the other two plots. Explain this phenomenon. An electron is excited from the n = 1 ground state to the n = 3 state in a hydrogen atom. Which of the following statements is/are true? Correct the false statements to make them true.a. It takes more energy to ionize (completely remove) the electron from n = 3 than from the ground state.b. The electron is farther from the nucleus on average in the n = 3 state than in the n = 1 state.c. The wavelength of light emitted if the electron drops from n = 3 to n = 2 will be shorter than the wavelength of light emitted if the electron falls from n = 3 to n = 1.d. The wavelength of light emitted when the electron returns to the ground state from n = 3 will be the same as the wavelength of light absorbed to go from n = 1 to n = 3.e. For n = 3, the electron is in the first excited state. Calculate the maximum wavelength of light capable of removing an electron for a hydrogen atom from the energy state characterized by n = 1, by n = 2. Use principles of atomic structure to answer each of the following:(c) Given these ionization values, explain the difference between Ca and K with regard to their first and second ionization energies. Use principles of atomic structure to answer each of the following:(d) The first ionization energy of Mg is 738 kJ/mol and that of Al is 578 kJ/mol. Account for this difference. For each of the following pairs of elements:(C and N) (Ar and Br)pick the atom with the higher ionization energy. Which main group atom would be expected to have the lowest second ionization energy? Arrange the following elements in order of decreasing first ionization energy Po, Cl, Te, and S. Rank elements from largest to smallest. Arrange the elements in order of decreasing first ionization energy. Rank from highest to lowest first ionization energy. To rank items as equivalent, overlap them. Which alkali metal has the highest ionization energy?